Use our resources to better understand tides. Study our beautiful poster above, explaining Earth’s tides. The poster does not include an illustration of king tides, but does include their little sister, spring tides. What is the difference between a spring tide and a king tide? The “Coincidental Alignment” section in the Nat Geo News article might help explain. King tides are spring tides that happen during specific times in the moon’s orbit around the Earth and the Earth’s orbit around the sun. When the moon circles closest to the Earth, it is in a position called perigee. When the Earth circles closest to the sun, it is in a position called perihelion. King tides are spring tides when the moon is in perigee and the Earth is in perihelion. The gravitational pull from both the moon and sun are even greater at these close distances, making king tides even more pronounced (higher and lower) than regular spring tides. This terrific graphic from the terrific Orange County Register gives a nice explanation and illustration. Look at the main illustration in our poster above. 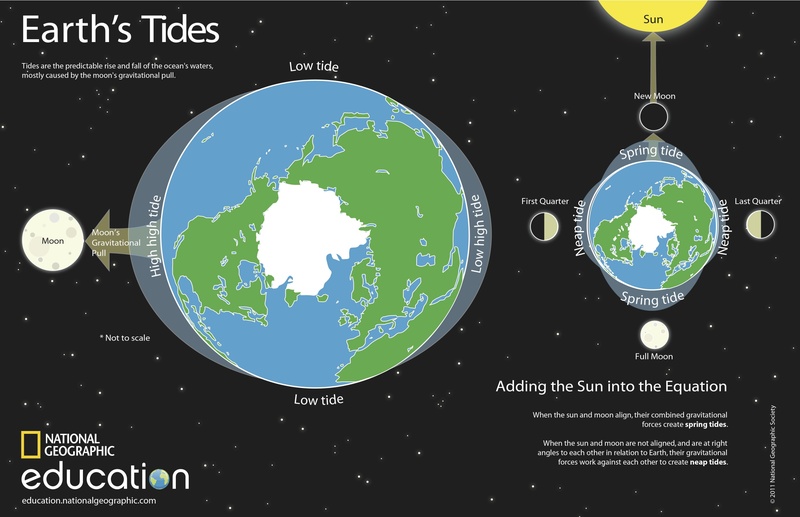 The illustration makes it clear how the moon’s gravitational pull creates a “high high tide.” But there is also a high tide on the opposite side of the planet—a “low high tide.” In fact, the tide is actually bulging in the opposite direction of the moon’s pull. How is this “low high tide” created? How does it even make sense? The short section on “High Tides” in our “tide” encyclopedic entry might help explain. A “low high tide” may be understood as the moon’s tidal force pulling the planet (not just the ocean) toward it. This causes the ocean to seem to bulge in place (although it’s gravitating, too) as the planet gravitates toward the moon. The California King Tides Initiative has a citizen science program that is “[U]sing photography to capture our changing shoreline.” Help document tidal variations by taking a photo!